I’m already in a Part D plan that suits me. Why should I bother comparing plans again at the end of the year? Because the plan that’s best for you this year might not be the best next year. Part D plans can change their costs and benefits every year, and most do. These changes may include premiums, deductibles, copays, the drugs they cover and whether they offer any coverage in the doughnut hole. To ensure that you get your best deal next year — a plan that covers all your drugs at the least cost and with fewest restrictions — you should carefully compare the plans available to you for next year during the open enrollment period from Oct. 15 through Dec. 7. Ideally, make a search through the Medicare Prescription Drug Plan Finder, as explained above. Or call the Medicare help line at 1-800-633-4227 and ask a customer service representative to make the same search. Why is it important to compare? Recent analysis shows that clients who reviewed plans for 2014 found an average savings of $220 a year, with some individuals saving over $5,000 per year. In some cases it turns out that the plan you have will still be the best one for you in the upcoming year, but you just won’t know if you don’t take the time to get a review of your options. 3. Changes in what drugs the plans cover and how well they cover them. 4. Changes in the medications you take. 6. Brand new plans will be offered which might save you money. What if I can’t find a plan that covers all my drugs? Find a plan that covers most of your drugs, especially expensive ones. Then talk to your doctor to see if any of the others can be switched to similar drugs that are covered by the plan. Also, your specific medical condition may qualify you for an exception that pays for a drug not on the plan’s formulary. Once you’ve joined a plan, you can appeal for an exception with your doctor’s support. What if I use few or no drugs right now? A plan with the lowest premium in your area would keep your costs to a minimum while providing coverage you might need later on. A plan with a zero deductible would cover even very low drug costs immediately. What if I live in different states during a year? A Part D plan that has in-network pharmacies nationwide will cover you throughout the United States. If a regional plan offers mail order services, your drugs could be sent to a temporary address in another state — but make sure the plan allows that option. Should a married couple choose the same plan? Not necessarily. Each spouse should consider plans separately, according to the drugs she or he takes. There are no price breaks for a couple joining the same plan. How do I compare “stand-alone” drug plans with Medicare Advantage (MA) plans? Traditional Medicare doesn’t include drugs, so you’d also need to join a separate stand-alone plan (which covers only drugs) to get drug coverage. Most MA plans offer medical and drug coverage as a comprehensive package, but not all plans cover drugs. Joining an MA plan means receiving your Medicare health benefits through the plan and accepting its terms and conditions. Most MA plans are HMOs or PPOs, which require you to go to the doctors and hospitals in its regional network or pay more to go out of network. (Two other types of MA plans, known as Private Fee for Service and Medicare Medical Savings Accounts, which are not available everywhere, have different arrangements.) Traditional Medicare allows you to see any health providers that accept Medicare patients, anywhere in the country. You cannot be in a stand-alone drug plan at the same time as being enrolled in an HMO or PPO type of Medicare Advantage plan, even if the MA plan does not include drug coverage. However, if you join a Private Fee-for-Service health plan or a Medicare Medical Savings Account plan that doesn’t offer prescription drugs, you can enroll in a stand-alone plan to add drug coverage. If you’re already in a stand-alone drug plan and join an MA plan that provides drug coverage, be aware that your enrollment in the stand-alone plan will be automatically canceled. If you’re already in an MA plan, be aware that joining a stand-alone drug plan will automatically cancel your MA plan coverage and re-enroll you in the traditional Medicare program. If you have health coverage from a former or current employer or union, joining an MA plan could automatically cancel your present coverage. Make sure you know the consequences to your (and your dependents’) health coverage before joining an MA plan. So deciding first how you prefer to have your medical care delivered will considerably narrow your choices. You can compare MA plans at the Medicare website. Enter your ZIP code and follow the instructions. What will I pay for Part D? The average Part D plan costs about $32 a month but prices can vary. In general if you buy a plan with a higher premium, you will pay less out of your own pocket when you actually use the plan. If your 2013 income was above $85,000 for a single person or $170,000 for a married couple filing jointly, you will be charged extra for your Part D premium in 2015. In 2015 the maximum allowable deductible for a Part D plan is $320, though many plans have lower or even no deductibles. Plans also charge varying co-pay amounts for the prescriptions. Sometimes they charge a flat-dollar co-pay and sometimes they charge a percentage of the cost of the prescription, called co-insurance. Most plans sort drugs into "tiers," with copays for drugs in the lower tiers costing less. If you are newly eligible for Medicare, you can enroll three months prior to the month you become eligible and up to three months after the month you become eligible — a seven-month period. When should I sign up for Part D? If you are just becoming eligible for Medicare, you should sign up for Medicare Part D at the same time that you enroll in Part B. If you already have a plan and are looking to compare new plans to lower your costs, the time to do this is every year during the Annual Enrollment Period (AEP) from October 15th- December 7th. Do not delay even if you do not take any prescription drugs regularly right now. If you wait until later to sign up, you will be charged extra on your premium for every month that you waited. The amount of the premium penalty changes every year. In 2015, you will be charged one percent of $33.13 for every month you are late in starting Part D. So if you have waited for two years, the extra charge would be 24 percent of $33.13, or about $8 extra per month. The only way to avoid this penalty without signing up for Part D is having equivalent drug coverage, called "creditable" coverage, from another source, such as a retiree plan. Your plan administrator can tell you whether your plan is considered creditable coverage. The national base beneficiary premium may increase each year, so the penalty amount may also increase each year. After you join a Medicare D Drug plan, the plan will tell you the amount of the penalty you owe, and what your premium will be. Generally, if you have TRICARE, you don’t need to enroll in Medicare Part D.
Will my Part D premiums increase because of my income? If your income level is higher than $85,000 for a single person or $170,000 for a married couple filing a joint tax return, you will pay higher Part D premiums. — To view the complete answer, select the question above. What options do I have for paying my Medicare Part D drug plan premiums? You should check with your plan, but most plans allow you to mail in payments or arrange for direct payment made from your bank account or credit card. — To view the complete answer, select the question above. Which tax year will Social Security use to determine my income-related Part B and Part D premiums? To determine your Medicare Part B premium or Medicare prescription drug coverage income-related adjustment amount, Social Security uses your most recent federal tax return information. — To view the complete answer, select the question above. What kinds of drugs aren't covered by Medicare Part D prescription drug plans? Medicare’s guidelines for prescription drug plans say that certain types of drugs may be excluded from all prescription drug plans. In addition, a drug cannot be covered under a prescription drug plan if payment for that drug is available under Original Medicare. An example is a drug that is administered in a hospital or physician’s office, such as a chemotherapy drug. Each prescription drug plan may have additional specific exclusions from its formulary—the list of specific drugs it covers. Why do some people delay enrollment in a Medicare Part D plan? If you have creditable prescription drug coverage (meaning it is as good as or better than the standard Medicare Part D drug benefit), you may decide not to enroll in a Medicare Part D plan or to enroll later. For example, if you have the Veterans Affairs (VA) health care benefits or TRICARE for Life, you have creditable prescription drug coverage. To find out more about Medicare Part D and enrollment options, see Prescription Drugs (Medicare Part D). Can I enroll in a Medicare Part D plan, Medigap plan, or Medicare Advantage plan if I am not enrolled in Medicare? No. You must be enrolled in Medicare in order to be eligible to enroll in a Medicare Part D plan, Medigap plan, or Medicare Advantage plan. A Medicare Part D prescription drug plan only requires that you be enrolled in Medicare Part A. However, in order to enroll within a Medigap plan or a Medicare Advantage plan, you must first be enrolled in both Medicare Part A and Medicare Part B. Do all Medicare Part D plans cover the same medications? No, each plan may have a unique list of covered drugs. The list of covered drugs is known as a formulary. Medicare requires all Medicare Part D plans to cover at least two medications in each therapeutic category/class approved by Medicare. The drugs within the formulary are assigned to tiers. The tier determines the co-payment or out-of-pocket costs a person within the plan will pay for the drug. If you take a medication that is not covered on your Part D plan's formulary, you will pay full retail price. What if I am moving to a new state and you have or want a Medicare Part D prescription drug plan? You can add a stand-alone Medicare Part D prescription drug plan, or change Part D plans, when you move from one state to another. You can make this change during the time period starting the month before you move and continuing for two months after you move. True out-of-pocket (TrOOP) costs refer to your Medicare Part D plan's maximum out-of-pocket amount. That is the total amount you are allowed to spend out of your own pocket each year on medications covered by your prescription drug plan. The TrOOP amount for 2015 is $4,700, meaning that once you have paid that much out-of-pocket, your drug plan's catastrophic coverage kicks in to cover you the rest of the year. What if Your Pharmacy Can't Fill Your Medicare-Covered Prescription Drug? As a Medicare beneficiary, you may one day be in a situation where your pharmacy can't fill your Medicare-covered prescription. If you're enrolled in either a Medicare Part D prescription drug plan or a Medicare Advantage (Medicare Part C) plan with drug coverage, there are a number of ways to deal with this issue. What's the difference between traditional Medicare and Medicare prescription drug coverage? Original Medicare — Parts A and B — helps cover hospitalization, outpatient medical services, and limited prescription drug coverage. The Medicare Prescription Drug Program (Part D) provides individuals with prescription drug benefit coverage. Are prescription drugs covered under Medicare supplement plans? By law, Medicare supplement insurance plans no longer cover prescription drugs. Prescription drug coverage, also known as Medicare Part D, is available separately through private insurance companies approved by Medicare. There is a choice of plans available, and plans vary from insurer to insurer. Can I get a Medicare Part C and Medicare Part D plan at the same time? Medicare Part C refers to Medicare Advantage plans, while Medicare Part D is prescription drug coverage. Most Medicare Advantage (Part C) plans include prescription drug coverage. These plans are officially known as Medicare Advantage Prescription Drug plans. Change to a different Medicare Advantage plan that includes prescription drug coverage. Drop your Medicare Advantage plan and go back to Original Medicare (Part A and Part B), and add a Medicare Part D Prescription Drug Plan. Switch to a Medicare Supplement Plan and add Medicare Part D Prescription Drug Plan coverage. You cannot add or drop Medicare Advantage or Medicare Part D plans at any time; you can do this only during certain enrollment periods. However, Medicare Supplement plans you can switch anytime. If your Medicare Advantage plan doesn't have prescription drug coverage, you might want to contact the plan before making any changes. If you add a separate Medicare Prescription Drug Plan, in most cases you’ll be dropped from your Medicare Advantage plan and returned to Original Medicare. I wish to cancel my Medicare Part D prescription drug plan coverage. What should I do? In most cases, you can only disenroll or cancel your Medicare Part D plan or Medicare Advantage plan during the Annual Enrollment Period (AEP) or annual Open Enrollment Period (OEP) which runs from October 15 through December 7 of each year. The easiest way to dis-enroll or cancel your Medicare Part D plan or Medicare Advantage plan is to call Medicare at 1-800-633-4227 and speak with a Medicare representative. You will need to provide Medicare with your Medicare Claim Number found on your red, white, and blue Medicare ID card. You can also dis-enroll by contacting your Medicare plan provider. However, if you wish to cancel your Medicare plan through your plan provider, your request to cancel your Medicare plan should be in writing. You can call your plan's Member Services telephone number on the back of your Medicare Part D or Medicare Advantage plan membership ID card and the plan representative will be able to tell you what you should write in your letter and where the letter should be mailed. We would suggest sending a cancellation letter registered with a delivery confirmation. The cancellation of your current Medicare plan coverage would be effective starting on January 1st. You may wish to consider just enrolling in the lowest costing Medicare Part D plan that is available in your area and then just view your monthly premium as insurance that you have just in case your prescription drug needs or health needs change (just protection from the year's uncertainties - like car or house insurance). Remember, if you are without creditable prescription drug coverage (for instance, you do not have VA coverage or employer prescription drug coverage) and then later decide to re-join a Medicare Part D plan, you may have accrued a permanent Premium Penalty that will increase the cost of your monthly premiums. Click here to see the current premium penalty. Although the Medicare Part D prescription drug program is voluntary, if you drop your prescription drug plan coverage and do not have any other creditable prescription drug coverage, you will be subject to a late-enrollment premium penalty for each month that you are without coverage. The penalty is calculated as an increase of 1% of the national base Medicare Part D premium for each month you are without coverage. Example from 2011: So a 12 month lapse in coverage equates to 12% of the national base Monthly Part D premium ($32.34 in 2010) added to your monthly premiums in 2011. In other words, your monthly premium will increase around $3.88 per month in 2010. The base Medicare Part D premium can change every year, but the penalty will be applied for as long as you are enrolled in a Medicare Part D plans. The average national base monthly premium used to calculate the penalty will probably increase a little each year, so your penalty will also continue to increase over the life of your Medicare Part D plans. There has been some discussion of eliminating the Medicare Part D premium penalty, but to date, the penalty remains in action. I am considering changing my prescription drug coverage to the Humana Walmart-Preferred Rx Plan and I was wondering if I can only go to Walmart for my prescriptions? No, you do not have to use Walmart as your only pharmacy. The Humana Medicare Part D plans include over 50,000+ pharmacies in their pharmacy network. However, you may pay much more for your prescription medications if you use a pharmacy other than Walmart, Neighborhood Market Pharmacies, Sam’s Club or Right Source (Mail Order). Again: Walmart, Neighborhood Market Pharmacies, Sam’s Club and Right Source (Mail Order) are the only “Preferred Pharmacies” for the Humana Walmart-Preferred Rx prescription drug plan. According to Humana, there are over 4,000 Preferred Pharmacies across the country. You can use other pharmacies in the Humana Pharmacy Network, but the cost-sharing amount may be higher for drugs purchased outside of a Preferred Network Pharmacy. Am I allowed to use a Drug Discount Program instead of my Medicare Part D plan? Yes. Medicare Part D prescription drug coverage is voluntary and, if you find a cheaper place to purchase medications, then you are permitted buy your medications without using your Medicare Part D prescription drug plan. A drug discount program will usually not work together with a Medicare Part D plan, so you cannot use a drug discount program along with your Medicare Part D coverage for added savings. Please calculate your savings using a drug discount program. You may be paying more for your medications with a drug discount card than with your Medicare Part D plan coverage. Some drug discount plans mention an average savings of 24%. However, the standard Medicare Part D plan design offers medications at 25% of the retail price. Also if you have high monthly retail drugs costs (for example, you buy drugs with a retail value of over $247 in 2015) you will reach your 2015 Medicare plan's Coverage Gap and be able to take advantage of Donut Hole discounts where you will receive a 55% discount on brand name drugs and a 35% discount on generic medications. (The Donut Hole discount will continue to increase until Donut Hole drug purchases will receive a 75% discount - meaning you only pay 25% of retail). If you purchase medications with a discount card and do not submit your receipts, your Medicare Part D plan does not have a record of your drug purchases, and you will not have the added safety feature of your Medicare Part D plan’s drug usage monitoring. If you are in your Medicare Part D Initial Deductible and/or Coverage Gap, and purchase medications using a discount card, you can submit your discounted formulary drug purchase receipts to your Medicare Part D plan so the drug costs will be included in your out of pocket expenses (TrOOP). You can only get credit for formulary drug purchases made at network pharmacies and during the Initial Deductible or Coverage Gap when you are 100% responsible for your drug costs. You can read more in our FAQ on the Lower Cash Price policy. If you try to save more money and stop paying your Medicare Part D premiums in an effort to leave your Medicare Part D plan, and do not have any other form of creditable prescription drug coverage (VA, TRICARE, Employer coverage), you will be subject to the permanent late-enrollment premium penalty should you ever decide to re-enroll in a Medicare prescription drug plan. If you have very high drug usage for example, in 2015 your monthly retail drug costs are over $590), you might not have recorded out-of-pocket drug spending high enough to meet your Medicare Part D plan’s Catastrophic Coverage phase where you can receive a 95% discount on the retail cost of your medications. As an alternative to a discount program, you can seek out retailer pharmacies with everyday or “usual and customary” low retail drug prices. Purchases from retailers with everyday low drug prices are not considered a one-time discount or a discount program, so your Medicare Part D coverage can be used together with the pharmacy's every-day low drug price. You can click here to learn more about network pharmacies with lower, everyday retail prices. I just joined a Medicare Part D plan in May. Will my new plan year start a year from now or January 1st of next year? Your new Medicare Part D plan year will begin on January 1st of each year. The Medicare Part D plan year runs from January 1st through December 31st of each year, so the plan year runs for a calendar year rather than 365 days from the date of enrollment. Every year, Medicare Part D prescription drug and Medicare Advantage plan providers re-evaluate the features and premium of their plans. Plan providers can change their plan's premium, deductible, cost-sharing, drug cost-sharing tier structure, covered drugs on their formulary and other features each year with these new features taking effect on January 1st of the following year. 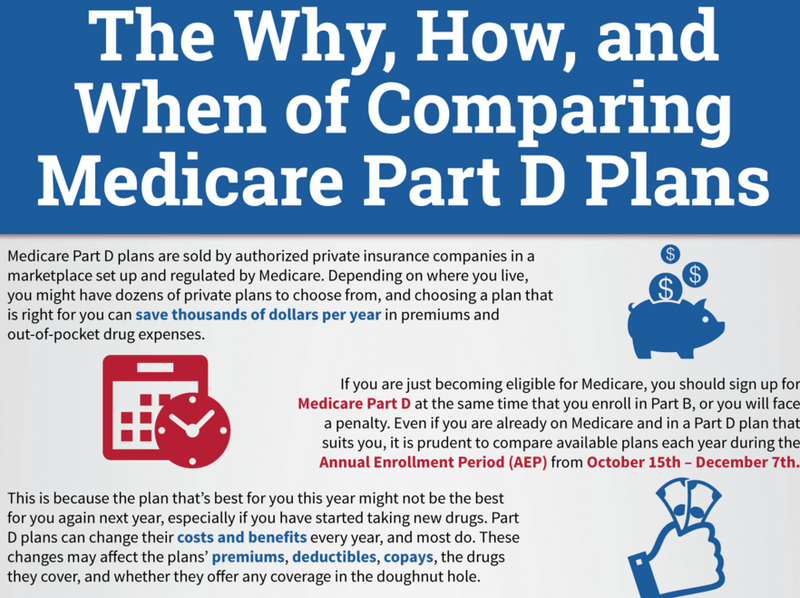 Because plan features can change drastically each year, it is important for each person to compare their Medicare Part D plan options during the Annual Open Enrollment Period (AEP) that runs from October 15th through December 7th of each year with new plan coverage beginning on January 1st of the following year. You are eligible to switch plans outside of the Annual Open Enrollment Period if you qualify for a Special Enrollment Period. What happens after the Out of Pocket Threshold (True Out of Pocket Cost or TrOOP limit) has been met? 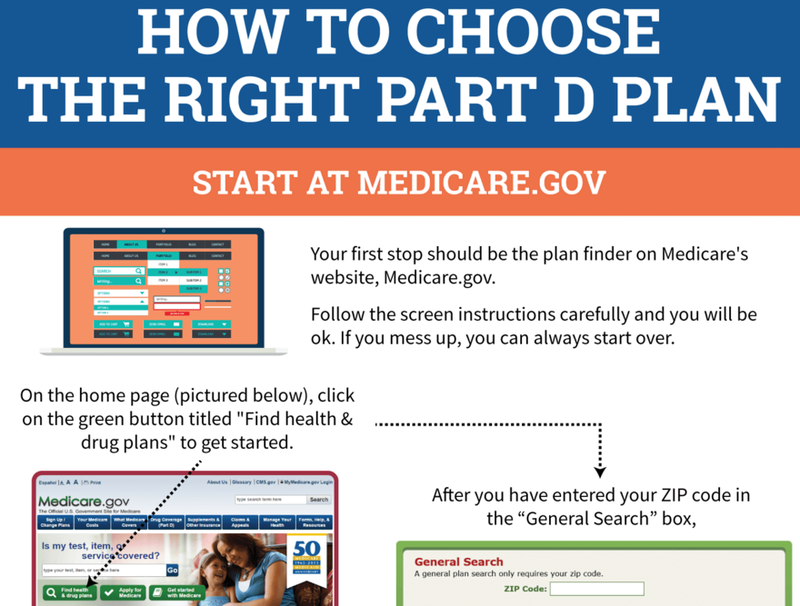 After you meet your Medicare Part D prescription drug plan's out of pocket spending limit, you will exit the Coverage Gap or Donut Hole phase of your Medicare plan and enter the last phase of coverage or Catastrophic Coverage. Your Medicare Part D Catastrophic Coverage phase has the same cost-sharing for every Medicare Part D plan. The beneficiary pays the greater of a flat fee or 5% of the plan's negotiated retail drug cost for medication, depending on the type of medication -- generics or preferred brand drugs that are multi-source drugs vs. all other drugs. The chart below shows the cost-sharing for the Catastrophic Coverage phase over the past few years. 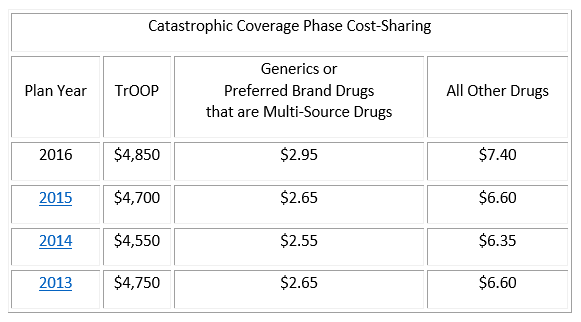 Keep in mind that the Catastrophic Coverage phase cost-sharing only applies to medications that are on your Part D plan's formulary (drug list). Therefore, if you take an expensive medication that is not covered on you Medicare Part D formulary, you will be responsible for 100% of the drug's cost even when in the Catastrophic Coverage phase. If you reach the Catastrophic Coverage phase, and you begin using a non-formulary medication, you may wish to file for a formulary exception to have the drug added to your Medicare Part D plan coverage so that it will be covered during all phases of your Medicare Part D coverage. Your Medicare plan does not automatically grant a formulary exception request and you may need to appeal a negative decision. If your Medicare prescription drug plan does approve your request, the medication will usually be added to the specialty drug tier. Once I join a Medicare Part D plan and I am locked-in for the year, can my Medicare prescription drug plan drop medications from its drug list during the year? Yes. Your Medicare Part D prescription drug plan's formulary or drug lists can change throughout your coverage year. However, your Medicare Part D plan must provide you with 60 days notice of any changes and cannot drop a medication for which they are already providing you coverage -- unless it is being dropped for reasons of safety or regulations or if it is being replaced with a new generic. You can use the 60 days to either find an alternative or substitute medication (for instance, you can ask your doctor about the new generic medication). You can also use the 60 days to ask your Medicare Part D plan for a formulary exception or coverage determination whereby you would continue to receive coverage for your existing medication. Please remember that your Medicare Part D prescription drug plan may not automatically grant a request to cover a non-formulary medication and you may need to ask your doctor to get involved to support your request for an exception. 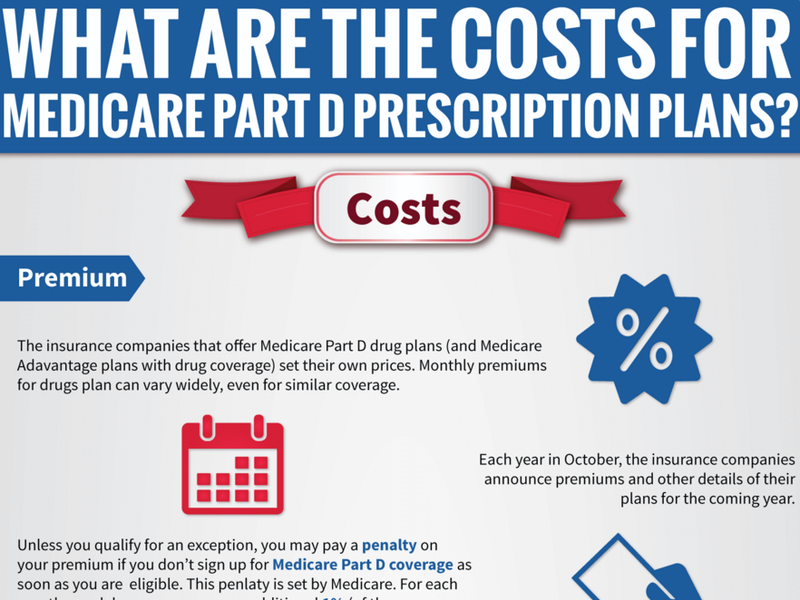 How does the 2015 Standard Medicare Part D work? If you pay a monthly premium. Deductible Stage - You pay a $320 deductible, which means that you will pay 100% of your discounted prescription costs until you meet this deductible amount. Some plans do not have a deductible. Coverage Gap Stage - After your yearly total drug costs reach $2,960, you move into the coverage gap stage. For 2015, you will pay 45% of the manufacturer’s discounted brand-name drug price and 65% of generic drug costs. You’ll also pay 45% of any dispensing fees and vaccine administration fees. If you are receiving Low Income Subsidy "Extra Help," these discounts are not applicable — you already have coverage through the gap. Catastrophic Coverage Stage- You will remain in the coverage gap until your total out-of-pocket costs reach $4,700, at which time you move into the catastrophic stage for the remainder of the calendar year. These values are set by Medicare on an annual basis. Are there any cost breaks for Medicare Part D for married couples? No. Medicare requires each spouse to pay separate premiums, deductibles and copays and coinsurance for prescription drug coverage and will reach each level of coverage according to his or her own drug costs over each calendar year. Is there an extra Medicare Part D premium amount because of my income level? Most people will pay the standard monthly Part D premium. However, you may have to pay an extra amount because of your annual income. For 2014, single or married individuals filing separately whose income is $85,000 or above, and couples with an income of $170,000 will pay the extra amount. If you are impacted, the Social Security Administration (not your Medicare Part D plan) will send you a letter telling you what the amount will be and how to pay it. This extra amount must be paid separately and cannot be paid with your monthly Part D premium. When can I enroll in a Medicare Part D plan? Initial Enrollment Period (IEP) - All individuals have an IEP. If you are just turning age 65, you can enroll in a Part D plan during the month of your 65th birthday, as well as three months before and after your birthday month. Annual Election Period (AEP) - The AEP occurs every fall. The AEP for 2015 runs from October 15th through December 7th, 2014. You can make as many plan changes as you want during the AEP, but the last election you make during this period becomes effective on January 1, 2015. Special Enrollment Periods (SEPs) - SEPs allow individuals in specific situations (for instance, moving into a new service area, losing employer group coverage, or a benefit plan termination by CMS) to make changes to their current Medicare benefit plan outside of the normal enrollment periods. SEPs exist year-round for dual-eligible and LIS individuals or those in Chronic Care Special Needs plans. What if I have drug coverage from my job or retiree benefits? The coverage offered by your employer may be better than the standard Medicare drug benefit. You should have received notice from your former or current employer explaining whether your coverage is "creditable," meaning it is at least as good as the standard Medicare prescription drug benefit. If you did not receive this information, you should contact your employer. If your drug plan is "creditable," you may keep your employer plan and you will not pay a late enrollment penalty. You may also enroll in a new Medicare Part D plan. Check with your employer to understand the impact that the joining a new plan will have on your coverage. Be sure to evaluate the benefits offered under your employer plan with the benefits offered by Medicare drug plans in your area to be sure you choose the best plan for your needs. If your employer plan does not qualify as "creditable coverage," you may pay a late enrollment penalty if you do not enroll in a plan offering Medicare Part D coverage when you first become eligible for this drug benefit, or if you have a break in coverage for 63 days or more. Your current or former employer or union must tell you if your present plan may change if you enroll in a Medicare Part D plan. What if I have an older Medicare Supplement (Medigap) plan that included prescription coverage? If you have a Medigap (Medicare Supplement Insurance) policy that includes prescription drug coverage, you must contact your Medigap issuer to let them know that you have joined a Medicare Part D plan. If you decide to keep your current Medigap policy, your Medigap issuer will remove the prescription drug coverage portion from your Medigap policy. This will occur as of the effective date of your Medicare Part D coverage. Your issuer will adjust your premium. Call your Medigap issuer for details. If you or your spouse has or is able to get employer group coverage, you should talk to your employer to find out how your benefits will be affected if you join a Part D plan. Get this information before you decide to enroll. What if I purchase my prescription drugs from outside of the United States? Medicare plans will not cover drugs purchased outside the United States. Will my costs change after I enroll in a Part D plan? The premium, deductible and copay/coinsurance for the plan you are enrolled in cannot change during the plan year. (January 1st through December 31st), but may change from one plan year to the next. Benefits, formulary, pharmacy network, premium, copay/coinsurance may change from one plan year to the next plan year. No. There could be differences in monthly premium, deductible, covered drugs, copay or coinsurance levels and the pharmacies that you can use. Some plans offer supplemental benefits, such as additional prescription drug coverage in the coverage gap. To determine which plan is best for you, compare plans in your area to learn what your benefits and estimated costs will be. Why do some people delay enrollment in Medicare Part D? If you have creditable prescription drug coverage (meaning it is as good as or better than the standard Medicare Part D drug benefit), you may decide not to enroll in a Medicare Part D plan or to enroll later. For example, if you have the Veterans Affairs (VA) health care benefits or TRICARE for Life, you have creditable prescription drug coverage.